This morning we are met by Loredana in the lobby of the Grand Miramare Hotel to begin our second day of sightseeing. Giancarlo is our private driver for the day. We begin with a brief stop in Rapallo- population 28,000, with boasting rights to over 700 varieties of olives grown in the region. The area is renowned for silk and damask cloth and is home to many famous poets. There's a picturesque castle in the sea, a small harbor, seaside promenade, and pedestrian shopping streets in the historical center, with renowned seafood restaurants. Giancarlo is maneuvering our van on narrow, cliff hanging, single-lane roads, up, up, and to the tippy top of the mountain; 600 meters high and falls directly back down to sea! What a beautiful sight! The road is so narrow that Giancarlo toots the horn when rounding the hair-pin curves on this one lane road… Someone may need to back-up to pass. We can tell the landscape has changed; we now see agave and cactus. Wow! Monorails steeply set on the terraced hillsides for the vineyard workers to transport the grape harvest in September. What back breaking work! We have arrived in Riomaggiore, safely I might add, at the southernmost village of the Cinque Terre. This is where Giancarlo leaves us and we won’t see him or the van again until we reach Monterosso al Mare. According to Loredana, origins of Riomaggiore date back to the thirteenth century and inhabitants during that time sought after a milder climate, to raise grapevines and olive trees. The town climbs up along the sheer-cliffs overlooking the sea and the facades of each house are beautiful, painted in rich colors, with slate roofs. There are many reasons to love Riomaggiore: fresh seafood, wine, and the place is just plain photogenic!! 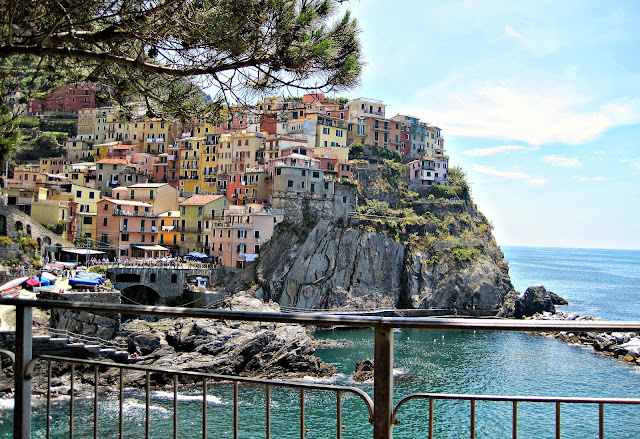 From Riomaggiore- Loredana has purchased our train tickets and we continue on to Manarola. Our train tickets are good for hop-on-hop-off in all the Cinque Terre. Manarola is the second smallest of the five villages but noted to be the oldest. We walk down the steep incline into Main Street, the only street, and pass several displays of Christmas Nativity exhibits, mounted on the cliff side, very curious. Loredana explains this village is known for their Crèche displays year round…nearly 300, with twinkle lights affixed to the mountain side. We climb up to a prominent point above their small harbor to see the incredible vista. We hop the train to Vernazza, the fourth village heading north, just in time for a beautiful lunch of mussels and fresh sea bream and more fabulous wine! Vernazaa’s port is famous for exporting goods, olives and wines and considered a true fishing village; sitting directly on the waterfront. From here many hikers walk the Via dell'Amore, "The Walk of Love"- to Corniglia. Its 368 steps upward to begin the walk………! We skip the walk of love but we learn there has been a rock slide in 2012 and it’s actually closed to walkers and hikers. We are saved the walk! We can see helicopters in the distance transporting buckets of concrete and equipment to the rockslide to make repairs. After lunch, we buy ferry tickets to Monterosso al Mare, the largest of the five lands with a long span of beach front. Monterosso still has the fortified stone walls from the thirteen century. Only ferries and fishing boats are allowed to come in close to shore. The water is pure turquoise today and with sunshine you only find in the Mediterranean climate. Monterosso has a population of only 1,200. There has been a celebration during the past few days, the..Mortis-et-orations festival. Commemorating sailors who left their lives at sea. Where children make designs on the sidewalks with flower pedals and use colored salts..like colored chalk in America. Curiously, there are six monks who live here on this remote island year-round. We conclude our five villages of the Cinque Terre tour and reflect on the beauty of the region, over wine back at the seaside promenade of our hotel. Travel magazines and postcard pictures do not do these villages justice… implausible splendor. The Five Lands can easily be done by train or ferry, since cars are banned. For a truly awesome experience hire Loredana and Giancarlo to take care of the arrangements and savor the beauty of the Cinque Terre! Thank you for joining our journey.